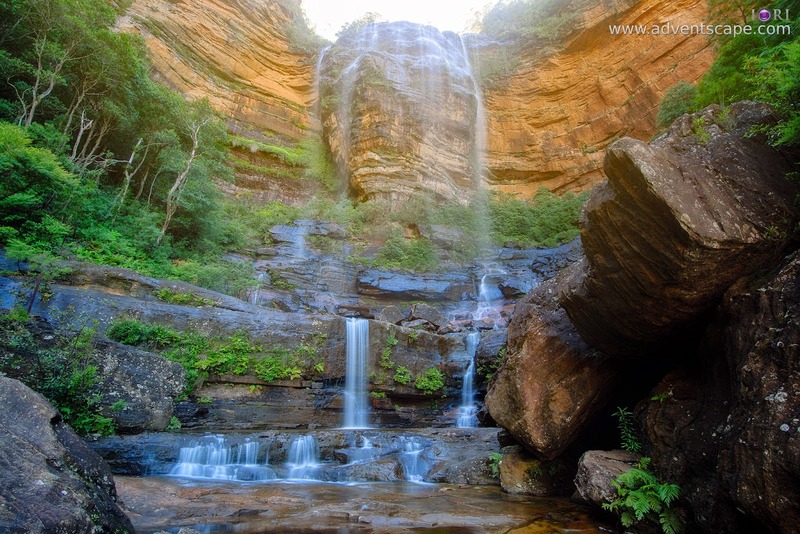 One of the places I wanted to revisit was Wentworth Falls. I've been here a few times now. I went last Saturday (31 January 2015) and that's my forth time being there. This place has amazing scenery very different from the city. Since this is a popular walk, you'll meet a handful of people along the way. The entire circuit is well maintained, thus track signs are every where, safety railings are present, foot steps are created and the trails are clear. Yes, there are heaps. But they are scattered in the 4 hour bush walk. There are still much walking before you see a landmark, but it's fine especially if you're not in a hurry. Though my intention is aerial photography, I still needed a camera to do the detail shots and the footage on foot. I used the 16-35mm since I'll be very close these landscapes. The 35mm is very useful when closing in, yet maintains that 'wide' look. I bring in a 1.2 ND filter to slow down shutterspeed and give that smooth silky water flow. I'm travelling as light as I can since I have a drone and a full frame camera. I also know that I’ll be walking for hours (I estimated 5 hours) so I need to prepare myself. I only brought 1 bottle of Gatorade, though. It seemed to last the whole trip. But during the walk back via Overcliff Pass, I did felt really hungry. DJI Phantom has GPS. For newbies and those who want to quickly fly a drone, the GPS helps tremendously. It stabilises the drone and keeps it in one spot. This prevents you from hitting something with your propellers. You just let go of the controls and rest assured that the Phantom will hover on the spot. I flew my drone the first time at Queen's Cascade. This is directly at the top of Princess Rock or Wentworth Falls. I was hoping that I'll get a good GPS reception, I need at least 7 satellites. But I only got 5 or 6. So the decision was made - I'll fly Atti Mode. In Atti Mode, the Phantom will try to level itself in the air, but will not lock it's location. It will continue to drift due to wind. If you try to counter this movement, then the drone will fly to that direction as well. For example, the wind blows from south to north. You counter that wind drift with your controller by telling it to gently fly south. The drone will fly south continuously. Eventually, you'll have to counter this south movement as well. I like to think Atti Mode to be semi-manual because you're focusing at the direction of the drone, not it's altitude. I was really nervous! Though I already have flight times, it's not enough experience to fly it in Atti Mode all the way. I flew with guts and luckily, I kept my drone in one piece without injuries (or tip over). Drones do eat up a lot of power. I only have 4 batteries. Each battery lasts for about 15-20 minutes. Thus you don't have the luxury of flying all the way any time, any where. I was thinking of flying at Queen's Cascade, Wentworth Falls, Sylvia Cascades and Empress Falls. I haven't had the chance to fly at Empress Falls as there were too many people around. So I decided to just leave it for another day. Although the solution is to buy and bring more batteries, that's an expensive and heavy solution. Original Phantom battery weighs 370 grams and costs $150-$190. It's still best to have flight plan and do it properly when you're on location.